In this new series on Viberant, we will be breaking down the career’s of some of the greatest artists of all time; ranging from their best performances, the power of their discography and the stature of their legacy. The first instalment will be about one half of legendary rap group Outkast: André 3000. Born André Benjamin in 1975, the Atlanta-based rapper met his now infamous friend Antwan Patton, aka Big Boi, in high school and formed Outkast with him. High school graduation was followed by the signing to record label LaFace. Three years after being plucky high school rappers with dreams of making it big, Benjamin and Patton brought out their debut studio album; a project with the staggering title Southernplayalistacadillacmuzik, to immense critical acclaim. The album went platinum in less than a year and Outkast won a whole host of awards, ranging from Rap Album of the Year and Best New Rap Group; the era of Outkast was well and truly upon us. ATLiens, Aquemini, Stankonia, Speakerboxx/The Love Below and Idlewild followed to formulate perhaps the greatest discography of any rap group ever. 1994 can often be referred to as the heart of rap’s golden era, with Nas bringing out Illmatic, The Notorious B.I.G. bringing out Ready To Die, and The Beastie Boys releasing Ill Communication. What Outkast accomplished with their acclaimed debut album Southernplayalistacadillacmuzik was bringing credibility to the South, offering something different to an era of typically hard raps and gang culture. The implementation of live instrumentals meshed within hip-hop production, as well as the heavily influential sounds of funk and neo-soul found in the album’s sounds makes it such a refreshing sonic experience. With this post being about André 3000, let’s focus more on him than Big Boi in this instance. 3K’s hooks were repetitive and punchy, while his flows were adaptable and his lyrical content was engulfed in Southern slang, helping to introduce listeners to the now undeniable sound of his vocals. André is lyrically very introspective on Southernplayalisticadillacmuzik, discussing fresh topics directly involved with his own life, including his school life and his desire to pursue ambitions. His verse on Git Up, Git Out is a poignant anti-drug message to adolescents, something which went against the grain of the rap song blueprint of the time; while his part on Crumblin’ Erb addresses the issue of black-on-black crime and the dangers of doing such a thing in this judgemental society we live in. ATLiens, Outkast’s second studio album, was a deep plunge into space-age production and outlandish vocal delivery. 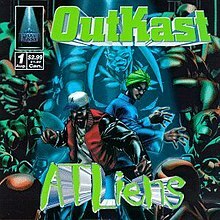 The album takes influence from psychedelic and progressive rock music and was modelled as a form of escapism as well as a platform for André and Big Boi to discuss their isolation from American culture; hence the mash-up title that considers them Aliens from Atlanta. Selling nearly 350,000 copies in it’s first week, this album had huge anticipation and delivered on all fronts, announcing Outkast as one of hip-hop’s most exciting entities. The lyrical content of extra-terrestrial life and it’s similarities with gangsta mentality still remains one of the most intriguing concepts on a rap album I have ever heard and critically it is a defining factor in ranking this album as one of the all-time greats of the genre. This album boasts my favourite Outkast song in Elevators (Me & You) which contains one of André 3000’s greatest hooks as well as his finest example of flow in his second verse. The tongue-twisting complexity of some of his deliveries were utterly mind-blowing on this album and it truly showed a growth in confidence and ability from the first album. On their third album Aquemini, Outkast peek through the looking glass of each other’s personalities; hence the album title being a portmanteau of both André’s (Gemini) and Big Boi’s (Aquarius) star signs. The pair are allowed to run wild on this creatively free masterclass of an album which can boast some of the group’s and particularly André’s greatest work to date; including Rosa Parks and the shudderingly important Da Art Of Storytellin’. It had funk in abundance as well as a live orchestrated band for the instrumentals and a vital blend of social commentary. Often labelled as the group’s best work ever, despite not reaching peak levels of commercial success at this point, Aquemini is an absolutely essential album not only for Outkast, but for the birth and growth of hip-hop in the Atlanta area; something we are seeing all over popular music at the moment through the likes of Migos, 2 Chainz and Young Thug. Through choppy but mesmerising cadences from André, you can hear the stunning lyrical displays and content of the breakdown of human emotion, both self-inflicted and those out of your control, such as heartbreak. The turn of the new millennium saw Outkast bring out their fourth album Stankonia, widely considered and accepted as one of the greatest rap albums ever. This album is very easily recognised as the project which boasts huge hits like B.O.B, So Fresh So Clean and of course, Ms. Jackson. Winning two Grammy Awards for it, Stankonia is a truly defining moment in both André’s and Big Boi’s careers, proving they could win over the masses as well as impressing critics. Ms. Jackson became the group’s first number one single and is quite clearly one of the biggest and best rap songs in my lifetime. What sets Stankonia apart from the previous efforts released by Outkast is it’s energy and almost chaotic approach at times; with some tracks possessing unprecedented tempos fitting for a transitioning period in the music industry. Despite taking obvious influence from artists of older times in the likes of Prince and Little Richard, Outkast’s main punch and delivery took a far more modern and forward thinking attitude, hence why the album is still looked upon so kindly today. This felt like the album that proved the hype and confirmed Outkast to be the best rap act on earth, bar none. Ah, yes, the ever-loved early 00s pop-rap album that appeared to change the landscape of hip-hop forever. What remains so incredible about Speakerboxx/The Love Below is that even to this day, 15 years on from it’s release, it doesn’t sound like it has aged a day. The bouncy, funky edge of a track like The Way You Move stands tall and the infectious hook and delivery on Roses could fit right into the current trend of popular rap music; and don’t even get me started on Hey Ya! That remains as one of the best-loved songs ever made and for good reason, how is it possible to release a song that good? Seriously. Labelled as two separate solo albums from the group and collated into a double album, it remains one of the most intriguing album setups ever and while Big Boi’s Speakerboxx side offers a great taste of G-funk southern raps, it is André 3K’s The Love Below which takes all the plaudits. The ambition alone makes this album a classic of our time and that is quite the feat given that so many artists attempt to make albums like this one, with a more flavour of the month feel, and fall flat on their face. That is the ultimate compliment I can give to them as a group and as performers, simply untouchable no matter what sound they craft. The sixth and final Outkast album is Idlewild, released in 2006. 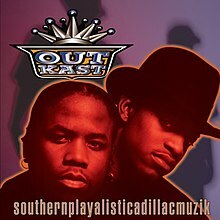 The ambition of the album couldn’t be faulted, something which was an overriding theme of the Outkast era, and there were moments of absolute genius on here, but this is without doubt the weakest of the group’s discography. With that being said, it performed commercially well and was critically received well at the time. What it all boils down to with Idlewild is that Outkast were ultimately the victims of their own downfall, releasing music at such a high standard that the moment there was a slight dip it would be exaggerated. Idlewild would be considered a good release by 99% of rap artists, but Outkast are that 1%; they go above and beyond to craft some of the finest hip-hop music of all time. In a magnificent review of the album, however, New York Post said the album’s multi-national influences and sampling “chronicled African American musical history with original tunes that transcend race and time”. The album will fall flat in the Outkast discography, but as a stand alone piece it can’t be denied as a solid release with classic moments and inventive ideas. Solo (Reprise) – Frank Ocean: André absolutely explodes with maximum shock factor and unexpectancy on Frank Ocean’s seminal 2016 album Blonde, with a cutting edge verse about the state of the rap game currently and how pleased he is to be Solo. Pink Matter – Frank Ocean: Why not mention his other verse on a Frank Ocean track, this time serving up an understated masterclass on the soothing, slick ballad Pink Matter; absolutely stealing the show on an already fantastic track. DoYaThing – Gorillaz: This 2012 release that was brought out to promote the Converse shoe Gorillaz had brought was far too good to be simply considered a promo track. André spits fire on a beat that involves the workings of Damon Albarn and even LCD Soundsystem’s frontman James Murphy, what more needs to be said? Sixteen – Rick Ross: Oh. My. God. The bars on this song blow my mind and for anyone who hasn’t heard it, just read this lyric that he provides: “How’s he God if he lets Lucifer let loose on us?/ That noose on us won’t loosen up, but loose enough to juice us up”. THAT IS WHY 3 STACKS IS ONE OF THE GREATEST EVER, it is truly lyrical dynamite delivered by one of the best to ever do it.